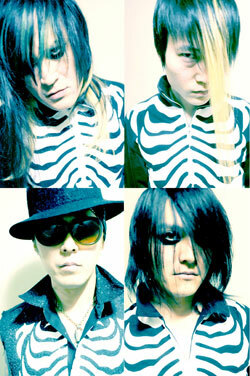 Balzac formed in 1992 in Osaka, Japan, and began playing shows mainly around Osaka and Tokyo. Vastly inspired by the legendary horror punk band the Misfits, Balzac (who adopted their name in a homage to the 1800s French poet of the same name) released their first single on their own label, Evilegend, in 1993. Through 1995, they released four more singles via various indies. In October 1995, Balzac released their first full length album, “Last Men On Earth” through Alchemy Records and due to their similarity to the Misfits – with their unique pop sound, horror movie image concept and so-called ‘Devil Lock’ hairstyle – they garnered attention not only in Japan but also overseas. In 1997 they signed to Phalanx Records and released their second album, “Deep.” Shortly after the release of “Deep,” Balzac was chosen to open for the Misfits’ first tour of Japan, and also did two nationwide tours of Japan with the Mad Capsule Markets. On Halloween 1998, Balzac released their third album, “13 Stairway,” followed by their first sold-out tour of Tokyo, Nagoya, and Osaka. The following Halloween, Balzac released a four-song Maxi Single, “Into the Light of the 13 Dark Night,” which was followed by their first headlining national tour. In August 2000 the limited production of 2,000 Balzac 12-inch figures by Medicom Toy Co. proved to be an unprecedented and widely talked about hit in the figure industry. Balzac and Medicom have since released many successful toy collaborations, reaching worldwide audiences in the collectible market. Like the Misfits, Balzac has an extremely loyal and devoted cult following worldwide that eagerly awaits and obsessively collects everything the band releases. At the end of 1999, in a style similar to the early stages of the Misfits Fiend Club, Balzac Fiendish Club was established, offering many special collectibles to club members only. To further support such collectible-mania, Balzac opened their first official retail store, Shocker, in Osaka on Halloween 2000. In 2002, producer John Cafiero orchestrated a collaboration between the Misfits and Balzac serving as the building block to Balzac’s inevitable launch beyond their Japanese audience into global recognition. The project was a split CD with each band covering a song from the other’s catalog. The result was “Day the Earth Caught Fire,” the first release from the new label imprint Misfits Records. The same Misfits-Balzac split CD was released in Japan via Balzac’s parent label DIW/Disk Union, under the title “Don’t Open ‘till Doomsday.” The split CD ranked at number 21 in New York City megastore J&R’s Top 50 CDs immediately following its release. When Balzac returned home to Japan, they put the finishing touches on their VHS/DVD release “The Legacy of Terrifying” filmed during the summer 2002 Terrifying Tour. They also issued a CD single, entitled “Beware of Darkness,” in January of 2003. The material recorded for that CD single was combined with newly recorded versions of greatest hits from Balzac’s Japanese back catalog, as well as live bonus tracks for a total of 22 new recordings that were compiled to create Balzac’s first North American release. Issued by Misfits Records under the title “Beyond the Darkness,” The CD included a bonus DVD with four music videos and a “making of” the album featurette. To coincide with the release of Balzac’s “Beyond the Darkness” and the Misfits’ “Misfits Project 1950,” Misfits Records arranged Fiend Fest, a special month-long summer festival tour. Fiend Fest was Balzac’s first North American tour, alongside the Misfits, punk staples DI, Agnostic Front, the Dickies, and the Damned. These two Japanese releases were compiled in their entirety to form Balzac’s second North American release, entitled “Out of the Grave and Into the Dark,” on Misfits Records (distributed by Rykodisc). The CD/DVD combo also includes the bonus track “Gimme Some Truth” and a limited edition, 60-minute bonus DVD featuring three music videos, five live performance videos, five bonus audio tracks, and a short horror film by Balzac. A limited edition Balzac book was released in Japan in late 2005 and 2006 brought two brand new limited edition toy collaborations with Medicom in Japan. 2006 also marked the very first North American Balzac toy release when a special limited edition black and orange paperbag man figure was produced in collaboration between Misfits Records, Super 7 and Secret Base of Japan. This highly limited edition color way of the figure, (complete with Misfits Records logo print on it’s back); quickly sold out and was followed by two more North American Balzac toy releases from Misfits Records (bloody skullbat & Ogon Skullman) that same year. In the summer of 2007 Misfits Records released Balzac’s third US studio album “Deep Blue: Chaos from Dark-ism” featuring over 60 minutes of new material. In typical fashion, the label maximized the release adding an additional 20 minutes of rare Balzac bonus tracks (many of which are exclusive to the North American pressing) as well as a special limited edition Bonus DVD containing over 2-hours of material including a full-length, professionally shot Balzac concert from Japan, 2 US Tour Documentaries, 5 music videos, additional rare live footage and more. The first pressing of the disc was issued in a special limited edition 32-page hardcover book; perfect bound and topped off with red foil ink. As if that weren’t enough 1-in-10 copies were personally autographed by all 4 members of Balzac and randomly inserted into the pressing. The edition quickly sold through and was followed by a jewel-case release featuring a 24-page booklet. In the fall of 2007 Balzac embarked on a North America tour in support of “Deep Blue” opening for the legendary Misfits during their 30th Anniversary campaign. “Deep Blue” is also available in digital download via iTunes in the U.S. and Canada, with three music videos, a variant 18-page booklet, and two alternate tracks not found on the CD version, (both of which are also available for individual download). A limited edition Skull shaped vinyl picture disc was pressed and released exclusively by Misfits Records. The collectible Ltd. Ed. die-cut disc includes both of the alternate tracks from the “Deep Blue” digital album and immortalizes the band’s iconic skull mascot on Side-A with a full-color band photo on Side-B. Balzac’s music was featured in “Jackass: The Game” (Red Mile Entertainment/MTV Games) for PSP, PS2, and Nintendo DS. The track “Wall,” from the band’s full-length debut on Misfits Records “Beyond the Darkness,” is included alongside punk greats the Misfits and the Circle Jerks, as well as up-and-comers CKY and Turbonegro. Summer 2010 brings a Ltd. Ed. 3-disc set featuring Balzac’s latest, full-length album of all-new material “Hatred” (Disc 1) plus exclusive bonus tracks. Disc 2 (“The Birth of Evil”) is a comprehensive collection of their rarest & earliest demo songs; re-recorded with the band’s current precision and ferocity. The double album includes 42 tracks, over two-hours of music plus a bonus DVD with 15 music videos from “Hatred” and more. 3 full-length discs (for the price of one!) packaged in a glossy, collectible, 6-panel digipak. The release is a must have for Balzac’s legion of fiendish fans and a perfect introduction for new recruits to the cult following of Atom-Age Vampires. “The Birth of Hatred” is available exclusively from Misfits Records. Look for several new releases from Balzac coming to North America on Misfits Records.